The GLB concept will debut at the Shanghai Auto Show next week. This week, Mercedes lifted the wraps off the new stylish AMG CLA35, but we don’t have to wait long until the German automaker’s next model debut. 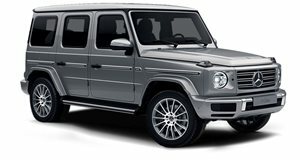 At the 2019 Shanghai Auto Show next week, Mercedes will present the Concept GLB previewing the upcoming baby G Wagon. We’ve already seen a render of the slick interior, but this latest teaser video posted on the automaker’s Facebook page gives us a first look at the GLB’s boxy body. The concept is shown in a rather sinister video that looks like it was taken from a Jurassic Park movie. This probably isn’t a coincidence, as the Mercedes M-Class famously starred in The Lost World: Jurassic Park back in 1997, and Mercedes also supplied several vehicles for the new Jurassic World movies. We get a close-up of the Concept GLB’s sleek LED headlights, while the roof-mounted lights hint at the small SUV’s off-roading prowess, as does the video’s tagline: "Get ready for an adventure.” Just don’t expect the roof-mounted lights to carry over to the production model. We also get to hear the Concept GLB’s engine start up, and it sounds very aggressive. Mercedes hasn’t said what’s lurking under the hood but being based on the same platform as the A-Class means the production GLB will share the same engine options as the compact sedan. America’s A-Class sedan is offered with a 2.0-liter turbo-four rated at 188 horsepower and 221 lb-ft of torque, while the more powerful AMG GLB 35 could have 301 hp and 295 lb-ft of torque on tap. Power will be sent to all four wheels via a seven-speed dual clutch transmission. Mercedes was also recently spotted testing an all-electric GLB. More details about the Mercedes Concept GLB will be revealed when the rugged SUV debuts on April 16 at Auto Shanghai. We wouldn't be surprised if the production version arrives either later this year or in early 2020.